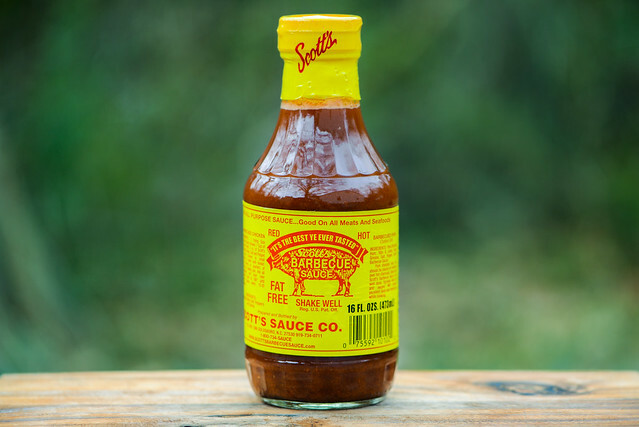 A true Eastern North Carolina sauce through and through, Scott's features not much more than vinegar and spice, and sometimes that's all you need to dress great barbecue. The Scott's Barbecue story starts almost a century ago when Adam Scott, an African American Reverend, began catering parties at the Algonquin Club in Goldsboro, NC. His barbecue became so well regarded that white men would come to his back porch to pick up some smoked hog and sauce. Adam Scott's son, A. Martel Scott Sr, joined his father in the business and they both ran their own Scott's restaurants in Goldsboro. Martel eventually took over the family operation, moved his restaurant to the business's current location, and tinkered with the sauce a bit. While the smoked meat arm of Scott's Barbecue has wound down some, the sauce still remains strong, selling over 750,000 bottles a year and has grown to be known as ubiquitously Eastern North Carolinian. There's no doubt about the base of this sauce as the nose fills with the tart aroma of white vinegar in the initial whiff. Along with that pungency comes a distinct peppery profile that mainly hints at heat, but also brings a slight earthiness along with it. Absent completely from the aroma is any form of sweetness or fruitiness. This rusty orange sauce is smooth and semi-opaque. That makes it easy to see the tons of small spice specs that give the sauce its orange hue. Its consistency runs just slightly thicker than water, creating a sauce that falls very quickly off a suspended spoon, leaving nothing clinging the silverware once its done falling. First taste of this sauce releases a mild vinegar tang. Quickly an earthy chili powder flavor comes in at the same time the tartness amps up. Both flavors continue to build to create a tingly burn on the tongue that leaves a final extra spicy and tangy taste that lingers for quite some time. 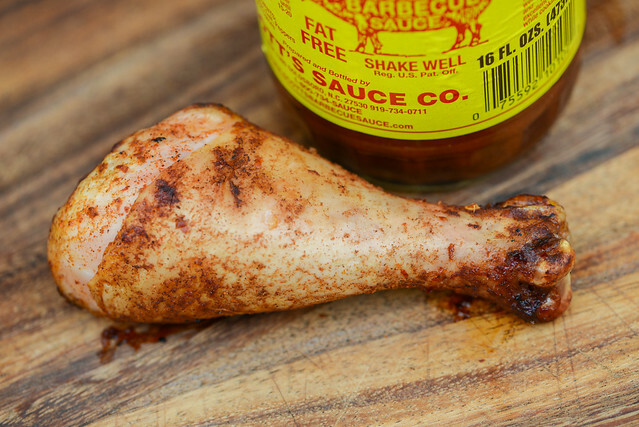 Brushing this onto the chicken seemed like a fools errand—it just dripped right off the leg. Some spices did cling though, which left the chicken with a dry rubbed appearance, but with little color, after being cooked over indirect heat. Once moved to direct heat, there was no caramelization or burning—the leg kept up its same pale appearance. Although it seemed like little to no liquid was making its way into the chicken, the flavor was actually fairly tart, creating a sour chili powder-like profile. This wasn't exactly the most pleasing flavor for the chicken, but the aftertaste was much like out of the jar—a nice balance of tang and heat, albeit to a lesser extent after being cooked. When I think of an original Eastern North Carolina sauce, I imagine nothing more than vinegar and spice, and that's exactly what you get with Scott's. 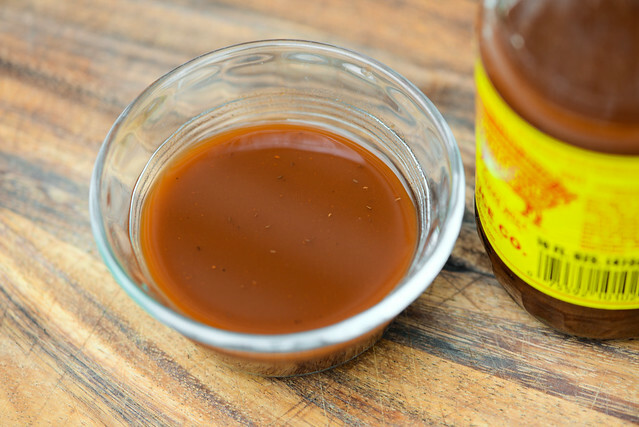 It tastes like a recipe that hasn't changed for years, which is its strength and weakness—it lacks some of the nuances of other vinegar sauces I personally like better, but each spoonful also tastes like a bit of barbecue history. The fact that it still holds up after 100 years is amazing, and I'm sure its plentiful spice will give any pile of pork a nice tangy heat. The bottle also touts a recipes for barbecue chicken, but I think the extra tartness isn't the greatest match for lightly flavored poultry mea,t as I found out in testing for this review. I've been a fan of Scott's for years. I think your take on it is right on the money. For me, it's the perfect sauce for pulled pork. It compliments it so well and adds the right amount of spice. Thanks for your efforts on MeatWave. I've learned a lot! Adam Scott taught me how to bbq a hog correctly as a child, growing up in Winston-Salem, NC in the 1950's. I still use his recipe he gave me and employ his technique to cooking hogs and shoulders today. He was the best -- Second to none ! His bbq sauce is still a standard' for North Carolina.